We do one-to-one biblical evangelism in the Cincinnati area. 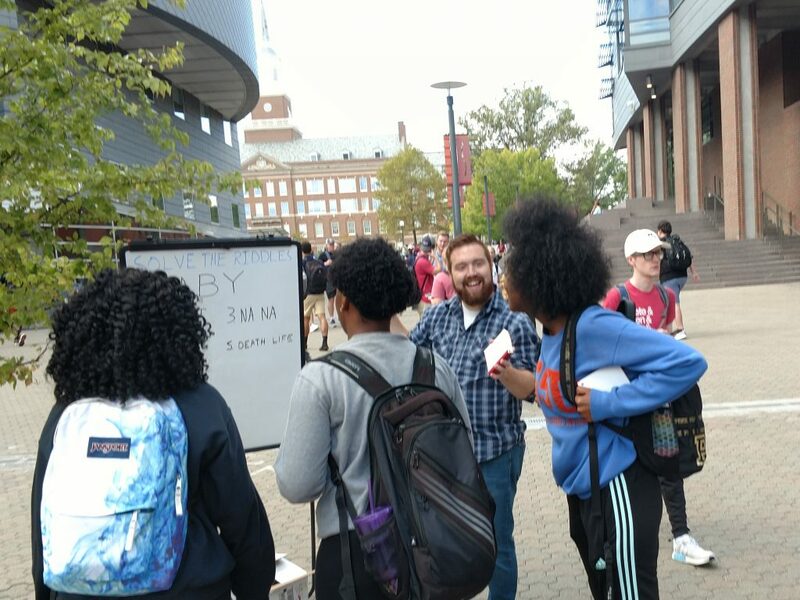 We are motivated to do evangelism on campus because Jesus taught that anyone who does not repent and put their faith in Him is headed for an eternal hell (Matthew 7:13-14). The Bible teaches that faith comes from hearing, and hearing through the word of Christ (Romans 10:17). So we share the law and the gospel with gentleness and respect and pray that God may perhaps grant them repentance leading to a knowledge of the truth (2 Timothy 2:25). But there are many people on the university campus today who do not share the Christian worldview. Barna Group research shows that 59% of young people who grew up in Christian churches abandon their faith within ten years of adulthood. Also, the unchurched has increased from 44% to 52% of the nation’s population. If you do biblical evangelism on a university campus, you will encounter a number of objections to Christianity. Here’s how to respond to 10 top challenges to Christianity on campus. Challenge #1: The Bible was written by men. Response: You have a nice backpack full of books. Were those books written by men? Also, have you considered that your driver’s license and birth certificate were written by men? While it is true that men can make errors when they write, it is also true that men write books which contain a lot of truth. Let me ask you this: Is there anything in the Bible that you have reason to believe is not true? Challenge: The Bible condones slavery. Challenge: What about the person in a foreign land who has never heard of Jesus? Response: God is not going to punish anyone for “not hearing about Jesus.” Has that person in a foreign land committed any moral crimes? Do you think that people who commit moral crimes should be punished? Have you committed any moral crimes? Challenge: Christianity borrowed from Mythras mythology. Response: Do you realize the TV show Star Trek predated the Space Shuttle program? Do you believe the Space Shuttle program borrowed from the Star Trek TV show? Actually, there are no credentialed scholars who claim that Christianity borrowed from Mythras mythology. The Mythras legends are late (dated after Jesus). And the scholars acknowledge that Jesus was a real person in history. Mythras skeptics have to deal with the historic Jesus. Let’s focus on your more serious objections. Challenge: I am a Christian but I am not into organized religion. Response: Do you accept scripture as authority? Have you considered Hebrews 10:25? The writer of Hebrews tell us not to neglect meeting together. The church is a gift to us from God. We can learn the truth about the scriptures and encourage others in the faith. Let me give you a quick test: On what basis would God let you into heaven if you were to die tonight? Challenge: I believe in Science. Response: I believe in Science too. Science is one way of knowing things. But Science does not account for love, beauty, and moral truths. Also, you can’t learn anything about history or God in a Science laboratory. Have you ever considered that you need God to do Science? For example, you need free will and objective morality to do Science. Challenge: I believe Jesus is a good moral teacher. Response: You believe Jesus is a great moral teacher. Great. Good moral teachers don’t lie. Let’s look at his teachings. Jesus said, I am the way, and the truth, and the life. No one comes to the Father except through me (John 14:6). If Jesus is a good moral teacher who did not lie, and he claimed to be the only way to God, there is a calling on your life to follow him. Do you know what that requires of you? Response: God is love. But God’s character has many other attributes including righteousness, justice and Holiness. God’s love does not trump his sense of justice. And God’s justice demands the punishment of moral law breakers. Have you broken any of God’s moral laws? Challenge: You are only a Christian because you were raised in a Christian home. Response: I learned math flash cards in my Christian home too. That worked out well because those math facts were true. The question is, do you believe Christianity is true? Do you have any reason to believe it is not true? Challenge: I believe in heaven but not hell. Response: Jesus believed in hell. Jesus’ teachings on hell were recorded at least 33 times in the 42 months of his ministry. He never told a lie. Jesus commands Christians to share the truth about hell with people so they don’t end up in hell. Do you think you are good enough to go to heaven? Let’s give you a test based on the 10 commandments. May God bless you as you share the gospel with university students. If you would like to join us at the University of Cincinnati, Northern Kentucky University or Miami University, check our outreach schedule.